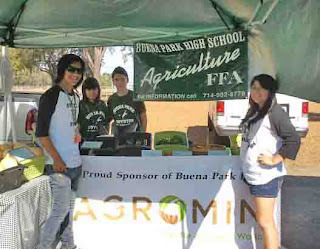 During the first weekend of September, six Buena Park High School ag program students harvested and packed up fresh produce grown at the school farm and headed off to two local farmers' markets. BPHS will participate at Buena Park Farmers' Market and Irvine Lake Farmers' Market the first weekend of every month. This month, the students brought butternut squash, spaghetti squash, zucchini, acorn squash, a variety of peppers and tomatoes, lemons and nectarines. At the Irvine Farmers' Market, BPHS students were filmed for a short segment on ABC 7 News about healthy eating. Some of the students who participated are new to the BPHS ag program and thoroughly enjoyed being able to sell their vegetables and fruit to raise money for their chapter. Way to go! Congrats to Buena Park High For OC Fair Wins!